This week, two interesting cruise reviews have arrived on our desk, one on the Pacific Princess, which is this summer offering 7-night round voyages from Vancouver to Alaska, the first time Princess has offered this itinerary in a decade, and the second on a coastal segment of Crystal Symphony’s Transatlantic voyage from New York earlier this month. For a change, and as they are both recent and topical, we thought readers might enjoy reading them. Finally, we bring news of the maiden voyage for TUI Cruises’ new Mein Schiff 3, delivered in late May by STX Finland. “If you’re going to sail from Vancouver on an Alaska cruise then by all means stay at the Rosewood Georgia Hotel before sailing. The art deco hotel, completed in 1927, has a complimentary classic Bentley limousine that can deliver you in great style to Canada Place to catch your ship. Because the Pacific Princess carries only 680 passengers, the boarding process is more relaxed than boarding one of the behemoths with between 2,000 and 4,000 passengers. 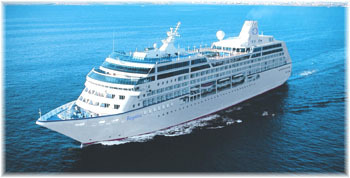 There are eight ships of this smaller class of ship in service, all having been built between 1999 and 2001 for the defunct Renaissance Cruises. Three operate for Oceania Cruises, two for Azamara Club Cruises, one for P&O Cruises and two, the Pacific Princess and the Ocean Princess, for Princess Cruises. Having travelled on sister ships with three other lines, we quickly found our way to our balcony stateroom. What better way to see Alaska than this, on a small ship with no crowds and a private balcony for whale watching? The standard balcony cabins are slightly short on space at 173 square feet (216 including the balcony) compared to some other ships, but quite suitable for a 7-night cruise. The closets feature real wooden coat hangers but this class of ship has never overcome the colliding doors of its closets and the en suite shower door directly opposite. Princess’s bathrobes, meanwhile, leave a little to be desired, all seeming to have shrunk from too much washing. They could hardly stretch around a standard-sized person, let alone anyone who might be fond of eating. The balconies on the Princess ships are finished in blue plastic marine decking as opposed to the teak found on Oceania ships. But other than such small quibbles, this is a great little ship and the service is enthusiastic. Getting to know the crew later, we found that the Pacific Princess’s officers are mostly Italian and the crew International. Assigned to the same table for dinner each evening, we got to know our waiter and station captain and they thrived on coming up with special requests such as the Indonesian hot chili sauce Sambal Oelek we asked for to go with our lobster the next night. Duly consulting with the Indonesian sous-chef, they came up with a gravy boat full of this specialty sauce that our whole table enjoyed. I doubt if we would have got the same service on the larger ships in the Princess fleet. Pacific Princess’s public areas have been well maintained and live up to their original reputation as country houses at sea, the grand staircase still being at the centre of the ship. 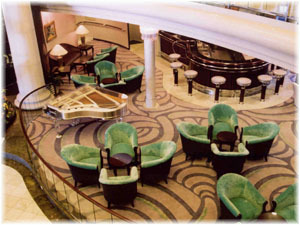 There is a modest cabaret lounge for this number of passengers, a great view forward from the Pacific Lounge atop the ship, main dining room in the stern and two alternative restaurants above, as well as the buffet restaurant on the pool deck that features an open air area overlooking the stern, not to mention the very classy library at the top of the main stairwell overlooking the pool from its aft perch. And on the main passenger deck, in addition to the photo gallery and two shops, there is a casino with its attached but separate Casino Bar with nightly entertainment as well as the Club Bar next to the main restaurant. Once aboard, there is quite a lot of pressure to buy a wine package as well as a ticket for the next day’s wine tasting session, but there is no drinks package on Princess’s two small ships. Nevertheless, compared to some other lines drinks are reasonably priced and it is possible to get a drink for between $5.75 and $7.50 plus 15% gratuity, and a bottle of Chianti for $30 (plus 15%) for dinner. The drinks bill for two for our cruise was $305 and the wine package $185 for 7 nights, totalling $490, or $35 per person per day including gratuities. By comparison, the drinks package on Oceania Cruises runs to $50 per person per day. Quibbles: Internet for a week on Pacific Princess ran to $204 for their most extensive package. 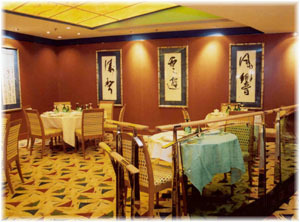 The extra tariff restaurants now charge $25 per person. The public bathrooms could use more frequent service. And the music could be updated by three decades from 1950s-60s-70s to 1980s-1990s-2000s. Overall, however, with the passengers she attracts, the Pacific Princess is a pleasing ship. The crew is solicitous and friendly and, with no crowds, the passengers are interesting and not loud. Many had actually booked this cruise because they had tired of larger ships. Canadians (182 passengers or 27.8% of the ship) formed the largest group on board and Americans (157 and 24%) came second, while there were many Brits (113 and 17.3%) and Australians (117 and 17.9%) on board, making it a sort of Commonwealth cruise. The Americans were mostly Californians and Midwesterners plus some Texans and there were also 85 (13.0%) of other nationalities, of which there were 29, with quite a few Chinese. Total passengers: 654. The ports of call for our cruise were Juneau, Skagway, cruising Glacier Bay and Ketchikan. While there are plenty of helicopter, float plane and glacier tours available, by far the most interesting for us was the White Pass & Yukon Route rail excursion, which runs from Skagway through the White Pass into Canada before returning to Alaska. Built at the time of the Klondike gold rush, the railway was reopened in 1988 as a seasonal tourist attraction and serves about 370,000 passengers a year between May and September. The White Pass, which operates on the first 67.5 miles (Skagway to Carcross, Yukon) of the original 110-mile line to Whitehorse, is today Alaska’s most popular shore excursion. 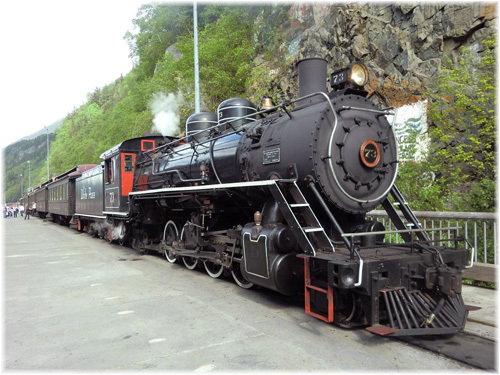 The line rises 2,865 feet in 20 miles of steep grades and cliff-hanging curves on the way up from Skagway to the summit and passengers experience a breathtaking panorama of mountains, glaciers, gorges, waterfalls, tunnels, trestles and maybe even the odd bear. All this while riding in the comfort of vintage parlour cars equipped with open platforms at each end. The White Pass rail fleet includes twenty diesel-electric locomotives, seventy open-deck parlour cars and two steam locomotives. The steam train excursion takes four hours and costs $159, the diesel-electric ones three to three-and-a-half hours and $119. Excursions come right alongside the ship at Skagway docks. Aside form the White Pass, there was Glacier Bay and its many different glaciers, Orcas and humpback whales aplenty and seals and eagles, and in Ketchikan, Annabelle’s on Front Street cannot be missed for its fine seafood chowder! Among the four ports and points of interest this makes for an excellent cruise with lots of variety (apart from the ubiquitous jewellery shops at all the ports of call). And the air is very fresh. On our return to Vancouver we were followed into port by sister ship Regatta, one of the three of this class of ship owned by Oceania, which after disembarking her San Francisco passengers moved over to Seaspan’s Vancouver Drydock Co Ltd for an 11-day upgrading to bring her to the same standards as that line’s newer ships, the 1,250-berth Riviera and Marina. Nautica and Insignia have undergone the same refit. The Pacific Princess offers eighteen 7-night cruises from Vancouver to Alaska this year, every Tuesday until September 9, the first time Princess Cruises has offered round trip Vancouver-Alaska sailings for about a decade. On September 16, she sails for Hawaii on the way to the South Pacific. 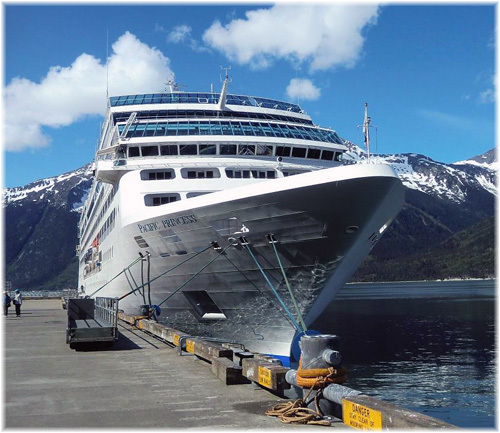 Oceania Cruises’ Regatta offers six 7- to 10-night Alaska cruises from Seattle, one 10-night Alaska cruise from Seattle to Vancouver, one 9-night Alaska round trip from Vancouver and a 10-night Alaska cruise from Vancouver finishing in San Francisco”. “My three sons and I are just back from a trip to New England and Nova Scotia. We used the Crystal Symphony as transport from New York up to Halifax. We were aboard Crystal Symphony for five days – she was on a longer voyage from New York to Iceland, but we only booked the segment to Halifax. It is nice that Crystal offers these short segments on their longer cruises, as they can be used to travel between ports that do not usually offer any passenger ship services. Our short voyage from New York also stopped at Newport, Boston, and Bar Harbor. 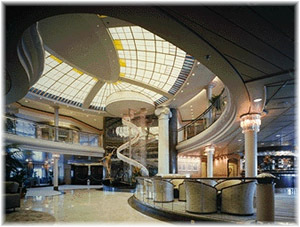 I am sure that most listers will not have a particularly high opinion of Crystal Symphony. She is one of the first of the All Outside Cabin cruise ships and in many ways resembles the very first AOC ship, Royal Princess (i). First of all the bad news, don’t sail Crystal Symphony if you are sailing for bold and exciting interior décor. It is all (well mostly) very bland modern big Hotel style. Lots of beiges, glass, and neutral colors. The only public rooms that had any notable style were the small Movie Theatre (bright white seats along with a light purple lighting) and the small wood-panelled library. Also cabins, while very modern, are on the small size for a luxury ship. But Oh the service! Honestly, this ship has the best crew and best service that I have encountered in 40 years. The ship has an international crew, but they are predominately from Europe and South America. Our female dining room steward was from Brazil and her male assistant was from Spain. They both offered top-notch service. Every crewmember that I encountered seemed to really be enjoying their job and all were friendly, outgoing, and interested in meeting the passengers’ requests. And much to my surprise, this ship has deck stewards who really do deck steward work! Not just selling you drinks (all are included in your ticket on Crystal) but they worked to find you a deck chair or seat, bring you some food from the Quick Service Lunch Counter (aka Trident Grill) or bring you a chilled towel. The other outstanding feature of the Crystal Symphony is the food. Really excellent, gourmet quality food served in a professional style. The menus offer a wide selection of items and everything I had was excellent. Special requests were quickly handled and welcomed. Food at the lido was also top notch, and the Trident Grill offered the usual hamburgers and hot dogs along with a lot of other choices like salads, pizzas, steak sandwiches, grilled chicken, fresh fruit, etc…. Also the free ice cream bar offered a broad array of choices along with milk shakes and ice cream floats. Afternoon tea was an event and really a meal within itself. Warm bouillon was served on the tenders on cool days! I can’t say enough good things about the quality of the food, the selection, freshness… I mean really it could not have been better in my opinion. So if you like a cruise for top-notch service and great food, I strongly recommend Crystal. Other features of the ship were a really nice and big swimming pool. A large hot tub. A wrap around promenade deck (but not deck chairs here). Tons of open deck space. A large deck tennis court. Small putting green. Secluded tanning space at the front of the ship. Another notable feature of this voyage was that you never had to wait more than about two minutes for anything! Even tender boarding only took a two-minute wait. All meals quickly served, room service right on time, shows on time, boarding the ship was a breeze, and leaving the last day was quick and easy. So as you can tell I loved the Crystal Symphony. I hope to sail on her, or her sister, again in the next few years. She is a bit more expensive than most ships, but you definitely get what you pay for. 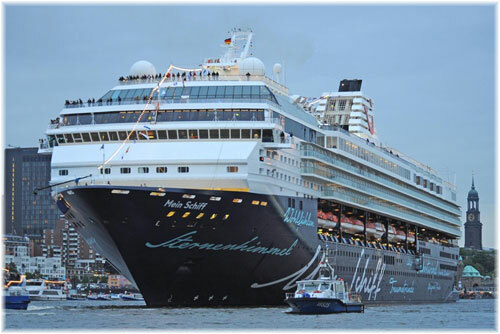 Friday saw the departure of TUI Cruises’ first newbuilding and Germany’s largest cruise ship, the 99,526-ton 2,500-berth Mein Schiff 3, after christening ceremonies in Hamburg before 1,700 invited guests and thousands of spectators. Notably aimed at the German market, ninety per cent of the new ship’s cabins offer ocean views and 82% have balconies, while she also features ten two-level suites with private roof terrace. 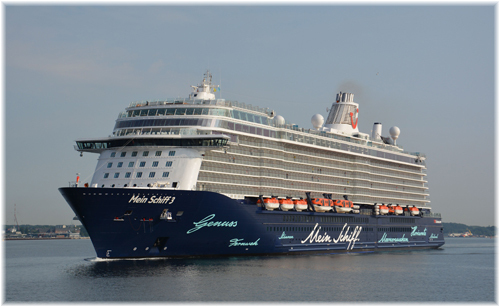 Mein Schiff 3 follows the 1,870-berth Mein Schiff 1 (ex-Celebrity Galaxy), introduced as the lines first ship in 2009, and Mein Schiff 2 (ex- Celebrity Mercury), introduced in 2011. These sister ships joined TUI Cruises from half-sister Celebrity Cruises, owned by 50% shareholder Royal Caribbean Cruises. And as well as being half owned by Germany’s TUI Group, TUI Cruises is associated with Thomson Cruises in the UK, Hapag-Lloyd Cruises in Germany and, in the expedition market, Quark Expeditions in Toronto. Mein Schiff 3 offers several different dining options, with restaurants including the Atlantic, which offers breakfast and a five-course gourmet menu, the buffet restaurant Anckelmannsplatz (named after the square in Hamburg where TUI Cruises and Hapag-Lloyd Cruises are located), Gosch, serving fish and other seafoods, the Backstube bakery and the Japanese restaurant Hanami. She also features a fine dining restaurant named Richard’s Fine Dining, the Surf & Turf steak house, the Day and Night bistro and an ice-cream parlour. Astern on Deck 14 is the Alster Bar & Grill. Other options include the Abtanz Bar, Diamond Bar, Sky and Sea Lounge, the Café Lounge, TUI Bar, Ueberschau-bar (Manageable Bar, a German play on words that is almost untranslatable), the Indispensable Bar and the Champagnertreff. Richard’s Fine Dining no doubt follows the Norwegian Cruise Line idea of naming shipboard venues after its ceo, with its O’Sheehan’s Pubs named after Norwegian ceo Kevin Sheehan. Richard Vogel, ceo of TUI Cruises, has recently announced that he will be leaving TUI after nine years to take up a position outside TUI, details of which have not yet been announced. Vogel has been a leader in developing the German cruise industry since his days starting up AIDA Cruises before his move to TUI. A new TUI Cruises ceo will be announced in the near future. Elsewhere on board, the exclusive X-Lounge has been designed to serve guests in the ship’s junior suites and suites. The ship also features a separate smoking lounge and the Look Bar, playing live music. The Big Freedom (Große Freiheit), named after a street in Hamburg where the Beatles played in their early days, is a trademark attraction of the new ship. A diamond-shaped glass exterior feature on the stern, it covers two decks over an area of almost 1,800 square feet and contains a number of alternative restaurants. Mein Schiff 3 also has the first philharmonic concert hall at sea. The 9-night maiden voyage itinerary takes the new ship to Palma de Mallorca via Le Havre, La Coruna, Leixoes, Lisbon and Cadiz. 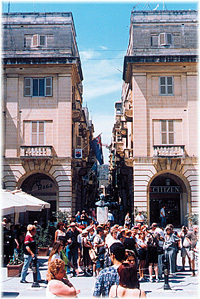 From Palma, she sails to Malta via Barcelona, Monaco, Ajaccio and Civitavecchia. From Malta, she will operate alternating 7-night cruises to the Western Mediterranean (calling at Monaco, Ajaccio, Civitavecchia and Catania) and the Adriatic (via Dubrovnik, Kotor, Brindisi, and Corfu). In mid-November, Mein Schiff 3 will switch to 7-night winter itineraries from Gran Canaria. Itineraries will alternate to Madeira, La Palma, Tenerife and Fuerteventura, and to Agadir in Morocco, La Gomera and Lanzarote. Sister ship Mein Schiff 4 is scheduled for delivery in Spring 2015. 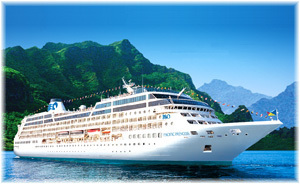 Her maiden voyage is scheduled for May 23, 1015, on a 10-night cruise from Kiel to the Norwegian Fjords and Copenhagen.